NOTE: From this post onwards, all photos are clickable for a high-resolution picture. 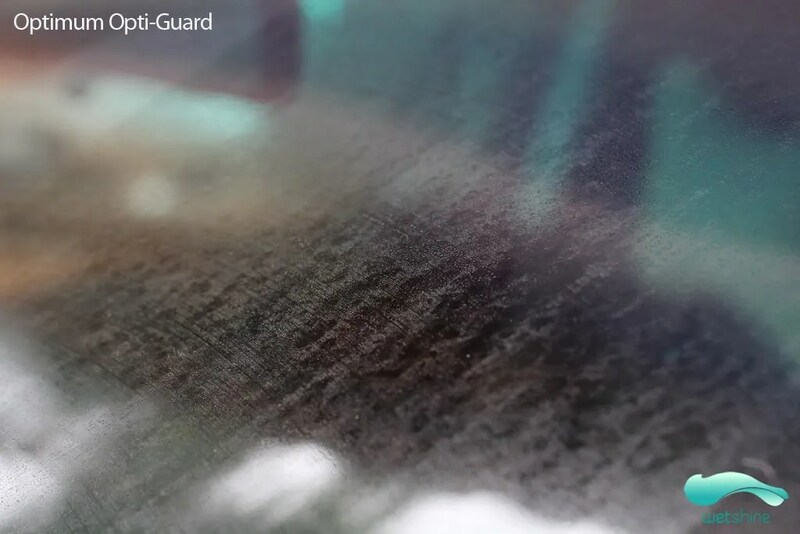 As shown in the photo above, Wolf’s Chemicals Glass Guard could not last 1 year due to wiper abrasion. If my memory serves me correctly, Glass Guard did not even pass 6 months. However, it is still repelling water on the areas where wipers to do not touch. This means that it will last well over a year on rear and side screens. 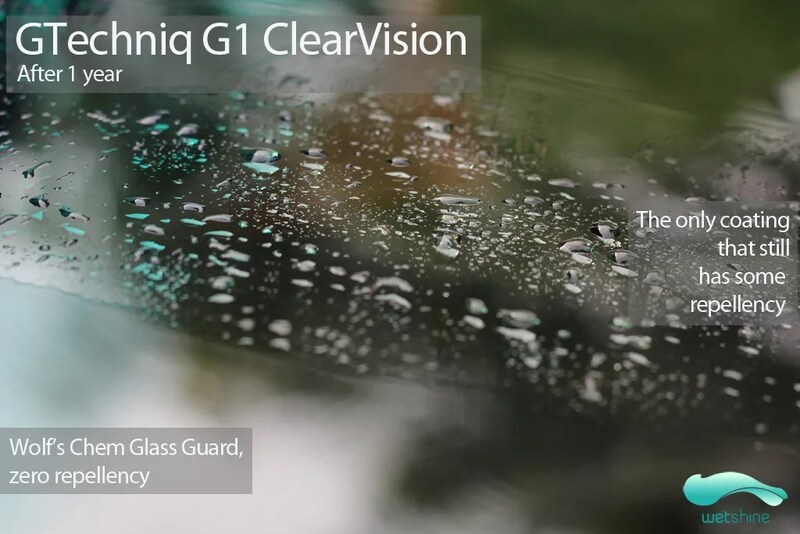 Gtechniq clearly showing repellency while Glass Guard below does not and the Aquapel above also does not. 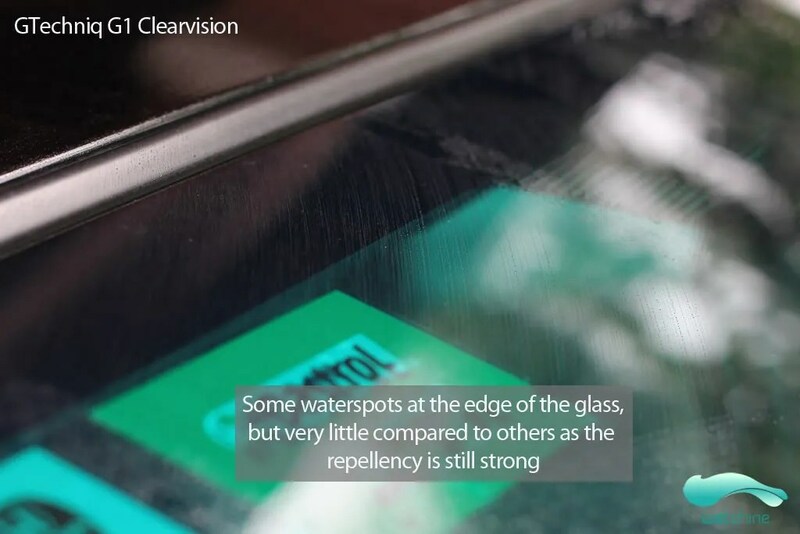 Again, areas where wipers do not touch are not a problem for good windscreen coatings, it’s the wiper abrasion that cause their durability to fall. 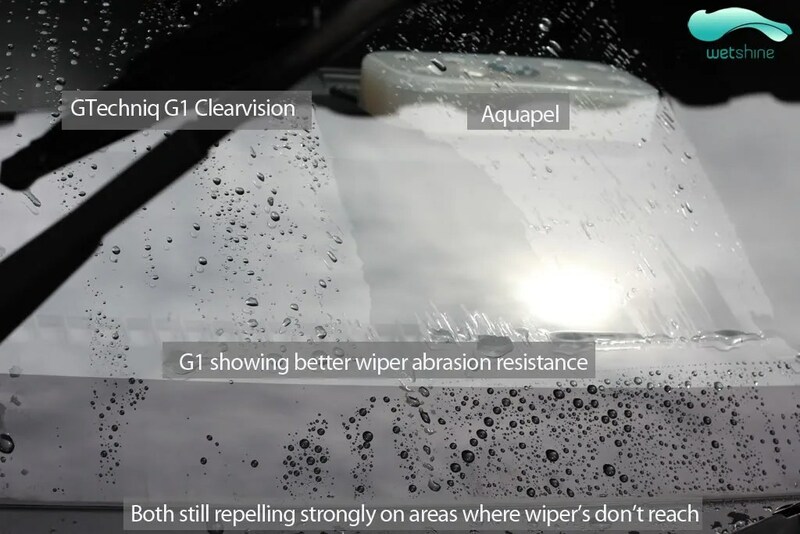 Aquapel had the 2nd strongest wiper abrasion resistance in this test, as you can see it still had some repellency to it, but mostly gone. When the glass is not repelling water, it is easier for it to get water stains as shown from the 2 photos below. 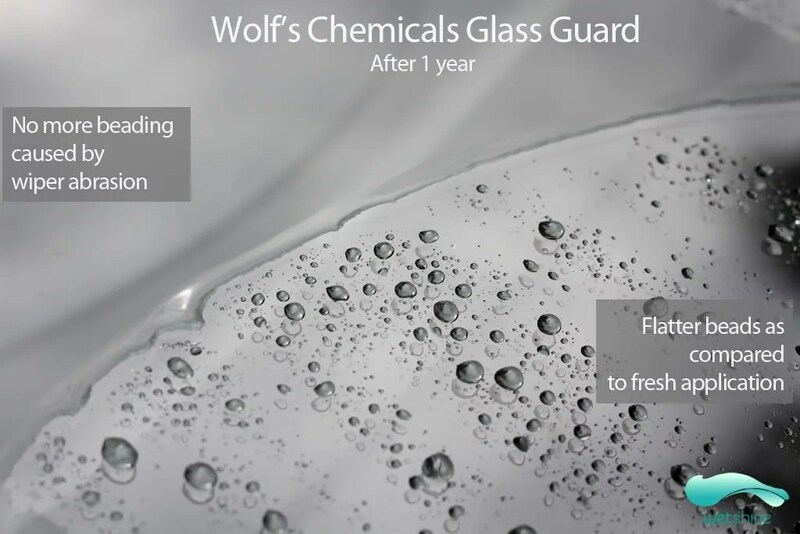 Rain-X actually lasted longer than Wolf’s Chemicals Glass Guard and even had better water repellency. 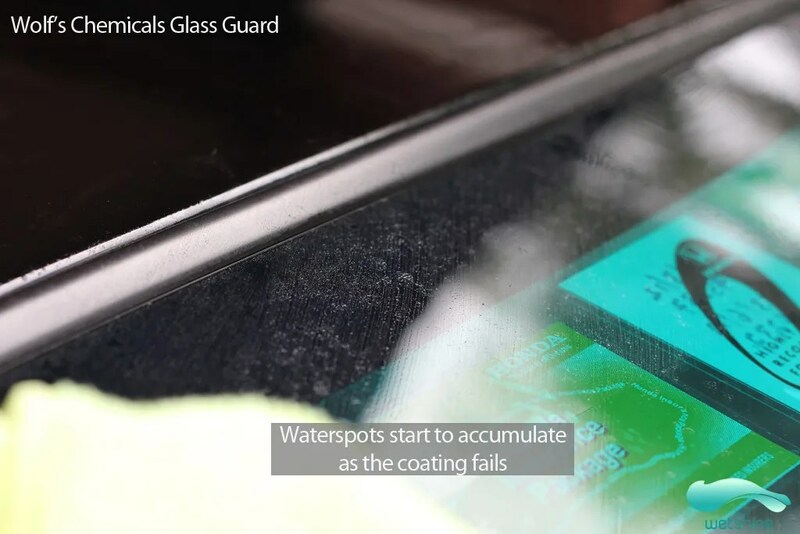 Glass Guard may have better protection against waterspotting. 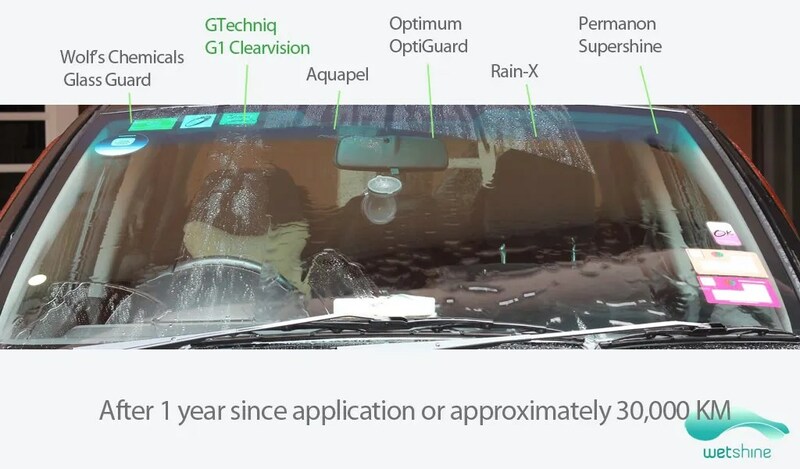 Optimum Opti-Guard although it can be used for glass, the repellency and durability just cannot match dedicated windscreen coatings. Permanon SuperShine(a.k.a GTechniq C2) was a dead-easy to apply coating, no buffing was needed, just rinse and there will be water repellency that can last 3-8 weeks. 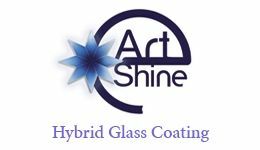 This test may be an unfair competition for it, but for a spray, spread and rinse product, it’s very good for glass. 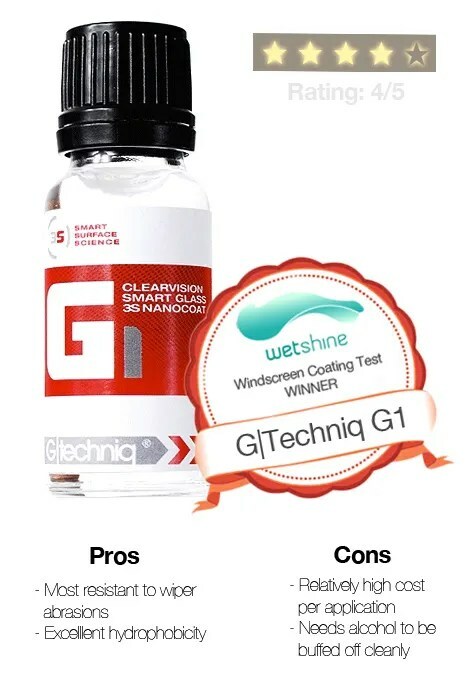 In the end, the winner is GTechniq G1! Although it is the best performer, costs should also be taken into consideration for your purchase decision. For commercial use, the detailer can charge more for a longer lasting product, but for a DIY-er, Rain-X is actually a decent choice, I can get it to last up to 8 months by reducing wiper usage and occasionally spraying the glass with some detailer spray. Only downside to Rain-X is that it does not protect from waterspot etching. For notifications of new posts, subscribe to me via email (top right corner). 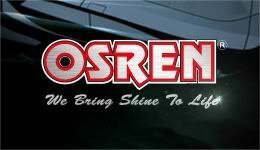 For updates of in between posts, like my page on Facebook. “thanks for that, i’m looking for something to replace rain-x but as a diy-er i dont know if i can justify the price of the gtechnic. Great post, and great site! Will contact you for a project if funds permit!